Nevermind the Elingamite wreck, we’ve found the real Three Kings treasure – Catton’s Cave, Rosemary Rock. There is so much to see in Catton’s Cave it’s hard to know where to look. Here are a few of Malcolm’s photos to give you a taste of both the jewel-box itself (as Severine called it) and the amazing wall outside the cave and we’ve captured some video footage for you to ogle too. 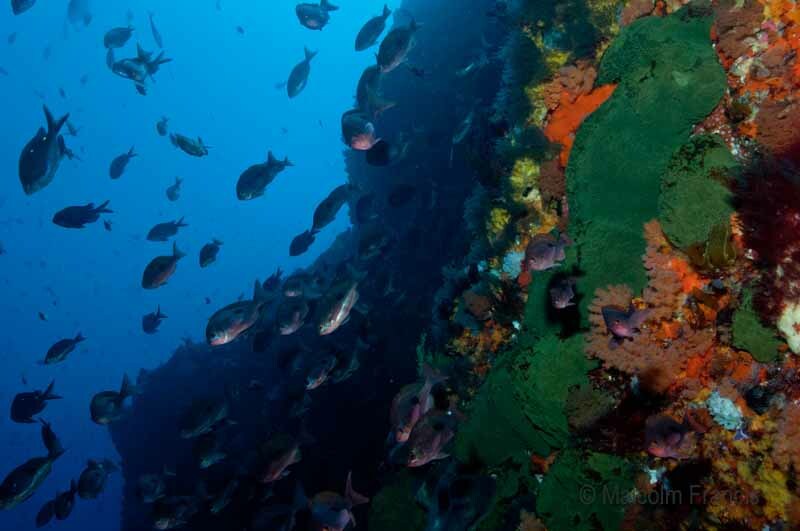 The stormy weather still has us sheltering inside, but before the weather turned we found our favourite dive site of the expedition so far – Catton’s Cave, on the south side of Rosemary Rock in the Princes Islands group - and we thought we’d take you on a virtual tour. 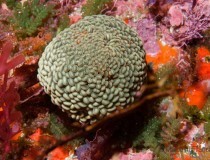 Oculina virgosa is a hard coral that is only known from Three Kings, the northern tip of North Island and the Poor Knights Islands. In other places they have seen it Richie and Skip say it lives quite deep, at about 50-60 metres, but here it is living in about 15 metres of water. Now I know this photo looks upside-down – but it’s not! I love the way that fish under an overhang are perfectly happy swimming upside-down, as they keep their bellies to the wall and their backs to the light. This half-banded perch is almost on top of some fragile white bryozoan thickets. 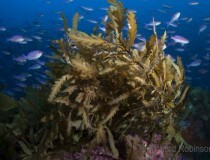 The apricot-yellow hard coral Oculina virgosa is on both sides of the fish, and there is a blue gorgonian fan to its left. 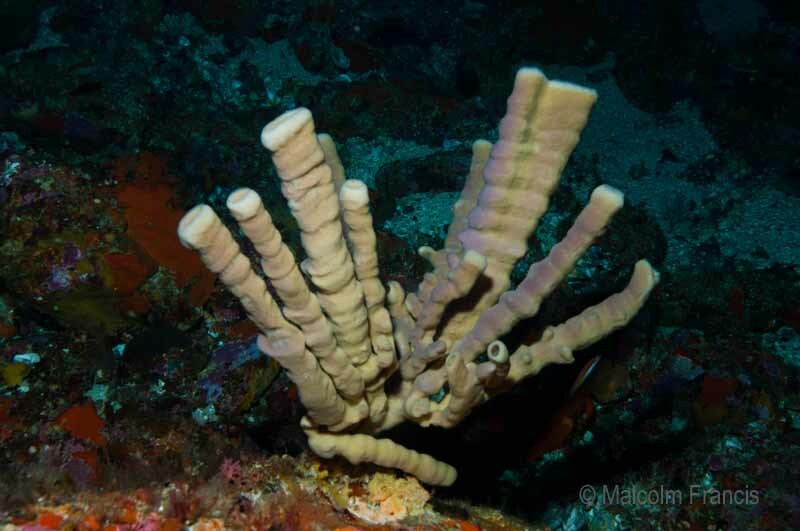 This organ pipe sponge Callyspongia latitubais is growing on the floor of the cave, but it also grows on the walls. Kareen and the invertebrate team aren’t sure what this is but they suspect it might be an ascidian. The beautiful white feather-like creatures are crinoids or sea-lilies living amongst the apricot-yellow hard coral Oculina virgosa. 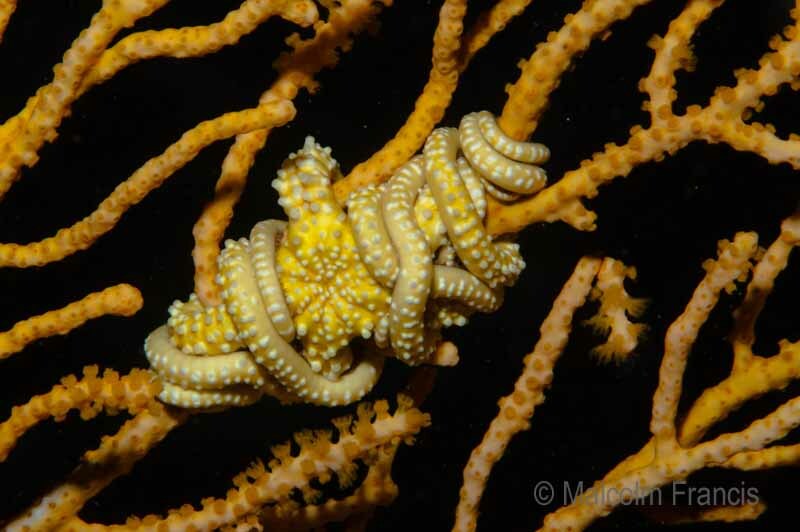 This yellow brittle star Asteroceras elegans has knotted its long legs around its preferred host, a gorgonian fan (Primnoa sp.). 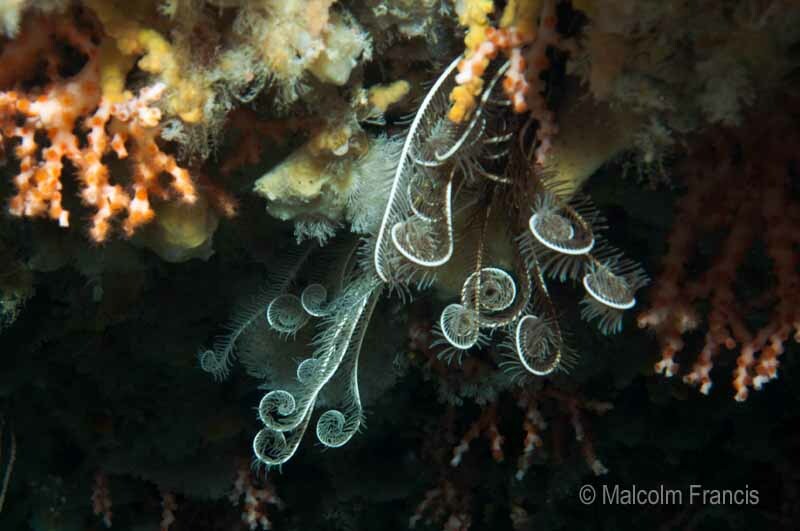 Most of the gorgonian fans are undescribed. 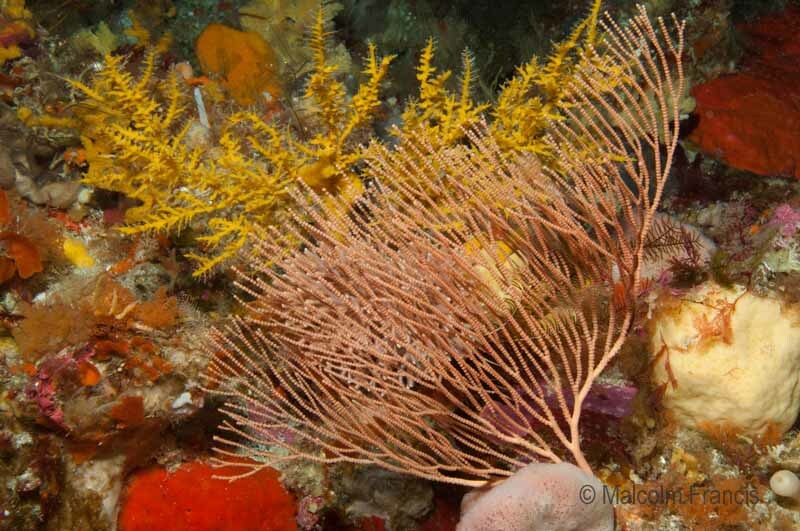 A peachy Callogorgia gorgonian fan and another mystery for our invertebrate team nestled in behind it – anyone know what the yellow plant structure in the back is? 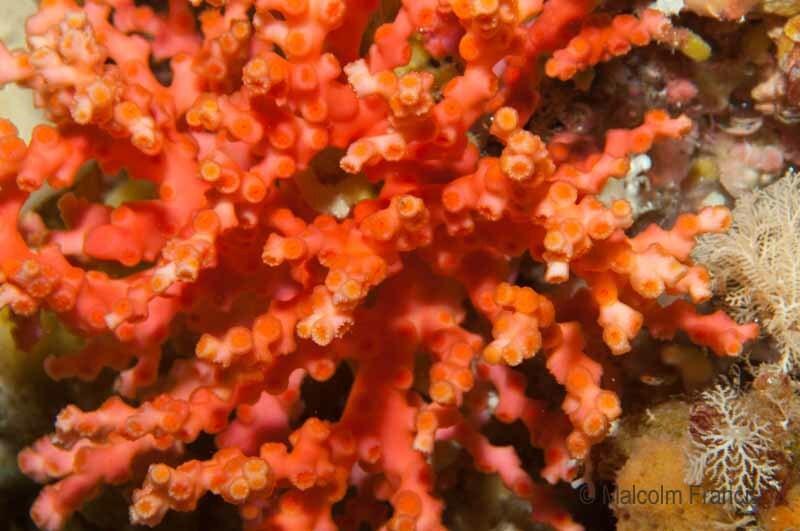 The peachy Callogorgia gorgonian fan in the foreground looks as if it is made of beads. And the yellow structure in the background is intriguing the invertebrate team and the photographers who haven’t ever seen anything quite like it before – they suspect it is a white hydrozoan (the feathery tips) that has been overgrown by a yellow sponge. Whatever it is it’s quite common around the Three Kings. This photo is taken at the edge of the cave. 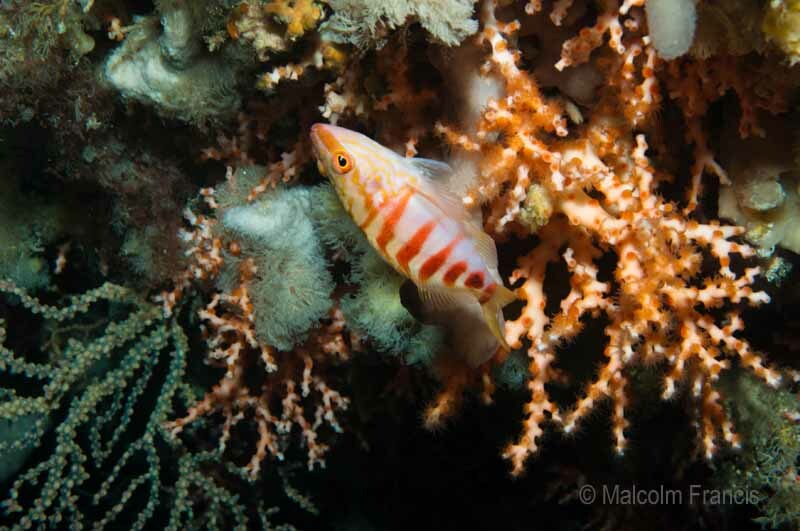 The fish at the right-hand side is a scarlet wrasse, next to a gorgonian fan, while the big crowd of fish outside are butterfly perch. 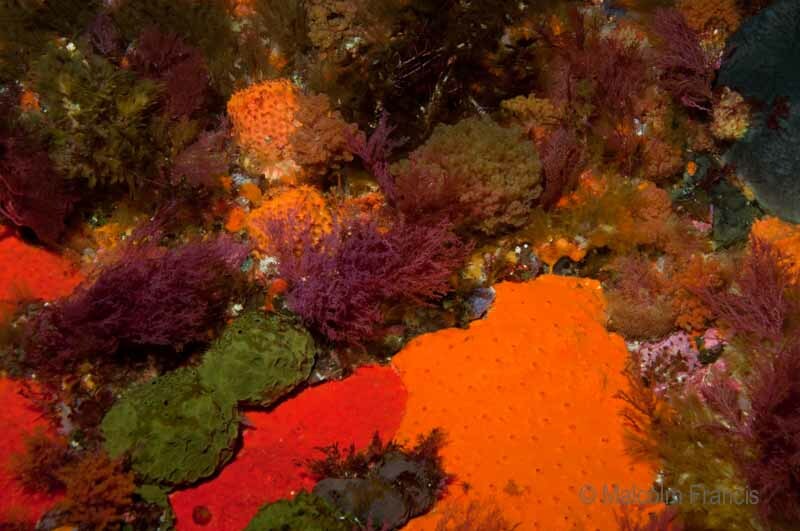 This is the vibrant wall outside the cave – the bright green sponges are Latrunculia, and there is also a black sponge called Stelletta. What looks like a small bunch of flowers in the middle of the photo is a colony of stalked solitary ascidians, a kind of seasquirt, that may be Clavelina. The fish are half-banded perch. 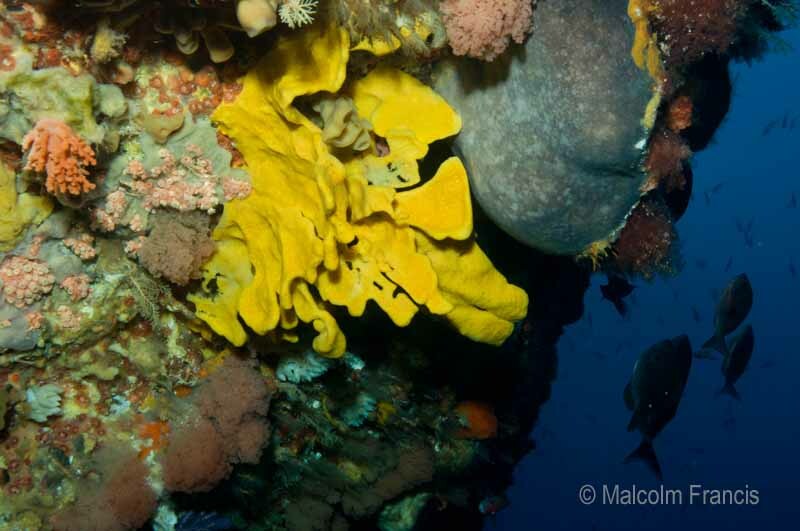 Another shot of the amazing wall outside the cave, featuring an unknown yellow sponge, the black sponge Stelletta and some pink fluffy bryozoans. Patchwork sponge: all along the wall encrusting sponges are fighting for space with each other and with soft red algae. 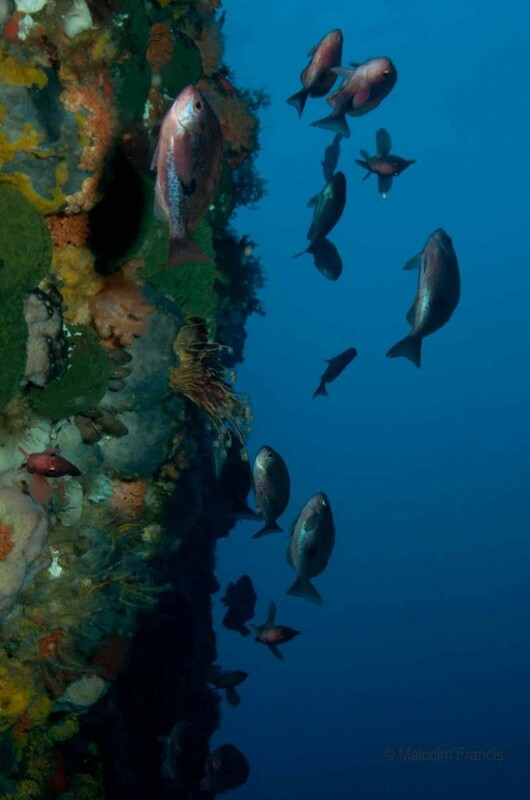 One last look: the wall stretches along the southern side of Rosemary Rock and as we swam past lots of fish were getting comfortably swept back and forth in the surge with us. We couldn’t finish without a bit of video – I’m not sure it does the rainbow-hued cave justice but hopefully you get a sense of the magic of this underwater world. The colours and textures in Malcolm’s photos are more representative of what we saw but the video gives a sense of how lush and abundant the walls of the cave are. 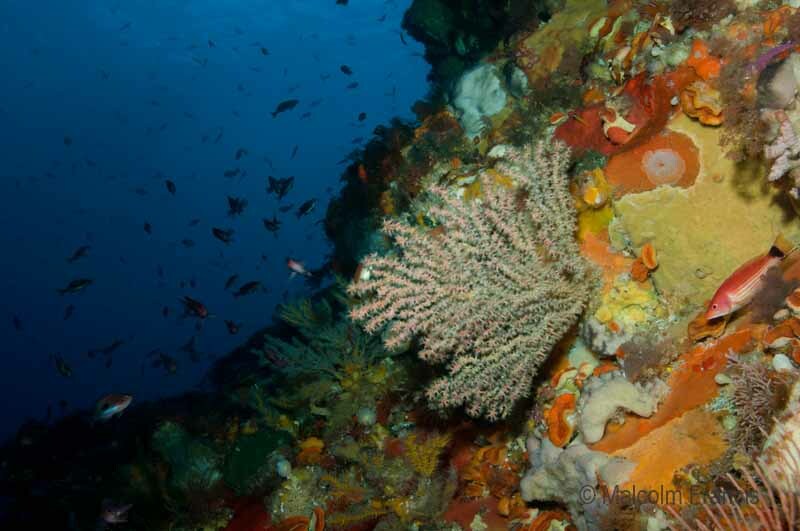 What you’re seeing in the video is one of the slightly overhanging walls of the cave, which is covered in a huge variety of colourful gorgonian fans, sponges, hydroids, crinoids and ascidians. Awesome, so rich & diverse in invertebrates, now I am feeling green, thanks for sharing these pics. Hi it looks amazing all the colours. 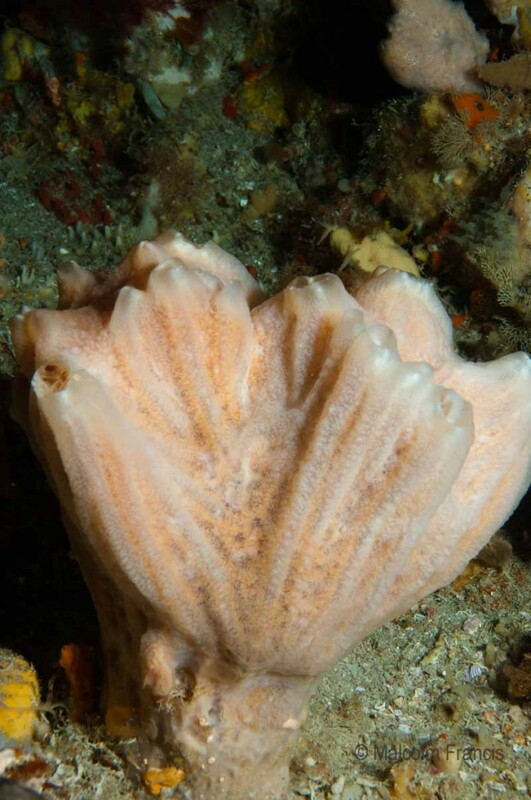 Check out the latest blog “We’re back under water” and you’ll see they’ve answered your question about ascidian – it’s actually a marine animal although it looks like a pretty plant! Has the storm gone away? 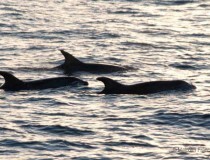 Have you been for any other dives? Hi Alia, yes, the storm is gone! The team were diving today so you can check out out latest post and see a photo of a stingray that swam up close to one of the team. 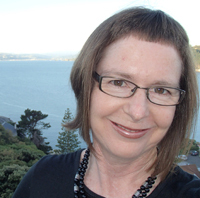 They’ll be back in Tauranga on Saturday so it’s nearly time to come home. Hi, the finds are just amazing and it would be great to see larger photos – is it possible to choose the option to allow the photo to enlarge on a click when you post to this blog? Hi Diane our files are quite lo-res so we can afford the satellite bill! but I will leave any higher res ones with the option to enlarge.